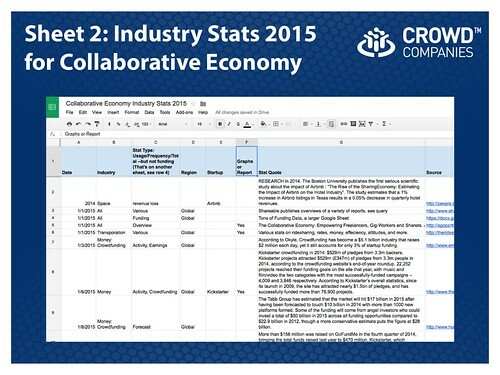 As part of our ongoing research on the Collaborative Economy industry, we collect, analyze, and forecast where this market is heading. In the spirit of transparency and sharing, we openly share this data with the open market. Each of the three sheets are in continual production and improvement. They don’t stay static for long. Although you cannot edit the online sheets, you can download the files, then edit, splice, or use in your own presentations at will. 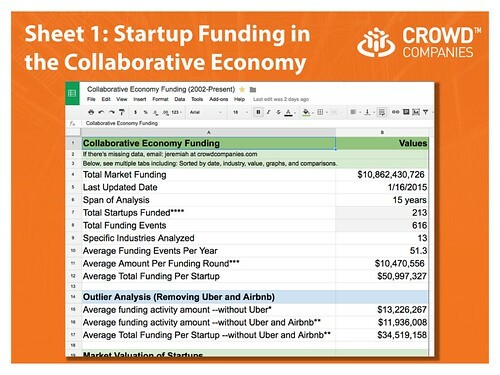 The first sheet, Startup Funding in the Collaborative Economy, is the most developed, with over a dozen tabs, which include analysis, graphs, and more. The second two, are works in progress. As the data in both fills up, we continue to analyze data, for charting. In any case, please bookmark this page. If you found it useful, please share it with others on social media or email. Above: Since Jan 1st, I’ve been collating data from articles, media, and studies in this handy Google sheet. It’s an index to where many studies on adoption, earnings, attitudes, growth, disruption are located. 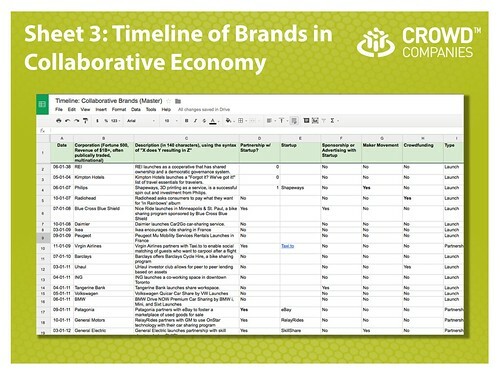 Above: Way over a year ago, I started a timeline of brands (first edition) deploying in this market, launched an updated (second edition) version, and designed it to convert into a Google sheet that can be scored and used to derive case frequency information. The analysis is completed and graphs will emerge, shortly. If you seek more in-depth information, please check out my Body of Work on the Collaborative Economy, a comprehensive starting point to all my publications. If you work at a large corporation, consider joining Crowd Companies, the council I created, focused solely on this topic. As much as I personally enjoy analyzing markets in order to understand what it all means, and enabling decision makers to chart the landscape, this practice is also useful for understanding where things are likely to head over the coming years in this exploding market. I look forward to your feedback. This is the second time I’ve posted links to these databases, the timing is right to re-inform folks as I see many questions about market data.